EVER gene belongs to larger family of proteins referred to as the transmembrane channel-like protein (TMC) family. EVER1/TMC6 protein, integral membrane protein, is located in the endoplasmic reticulum (ER) of keratinocytes, where it forms a complex with zinc transporter-1 (ZnT-1) a membrane protein responsible for zinc efflux and resistance to zinc toxicity, thereby controlling the cellular zinc balance. The EVER1 protein is predicted to have 10 transmembrane domains and 2 leucine zipper motifs. The EVER1 gene encodes 2 altertively spliced proteins, one of 805 amino acids and the other of 454 amino acids, in the same open reading frame. The EVER genes are thought to be transcribed in numerous tissues including the skin. Mutations in the TMC6 are implicated in the development of the rare autosomal recessive disease Epidermodysplasia Verruciformis (EV). EV is characterized by extreme susceptibility to infection by cutaneous human papillomaviruses (HPV) of the beta genus. The TMC6 genes may be involved in controlling HPV gene expression and replication in epidermal keratinocytes or they may directly affect inte and adaptive immune responses which control the clearance of HPV-infected keratinocytes in EV cases. A recent report indicated an association between genetic variation in the TMC6 region and development of cervical cancer (CxCa) . Immunohistochemistry of TMC6 in human spleen with TMC6 polyclonal antibody ( Cat # PAB13359 ) at 2.5 µg/ml. Western blot analysis of TMC6 in A-20 cell lysate with TMC6 polyclonal antibody ( Cat # PAB13359 ) at ( A ) 1 and ( B ) 2 µg/ml. Immunohistochemistry of TMC6 in human spleen with TMC6 polyclonal antibody ( Cat # PAB13360 ) at 2.5 µg/ml. Western blot analysis of TMC6 in human spleen tissue lysate with TMC6 polyclonal antibody ( Cat # PAB13360 ) at ( A ) 1 and ( B ) 2 µg/ml. 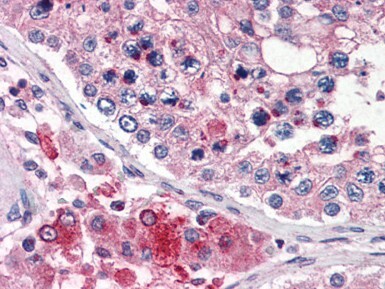 Human Testis (formalin-fixed, paraffin-embedded) stained with TMC6 antibody AP22604PU-N at 5 µg/ml followed by biotinylated goat anti-rabbit IgG secondary antibody, alkaline phosphatase-streptavidin and chromogen. 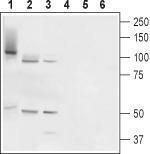 Western blot analysis of EVER1 in A-20 cell lysate with EVER1 antibody (AP22604PU-N) at (A) 1 and (B) 2 mg/ml. 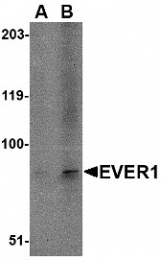 Western blot analysis of EVER1 in A-20 cell lysate with EVER1 antibody at (A) 1 and (B) 2 ug/ml. Immunohistochemistry of EVER1 in human spleen with EVER1 antibody at 2.5 ug/ml. Western blot analysis of EVER1 in human spleen tissue lysate with EVER1 antibody at (A) 1 and (B) 2 ug/ml. Immunofluorescence of EVER1 in Human Spleen cells with EVER1 antibody at 20 ug/mL. Western blot analysis of rat prostate (lanes 1and 4), rat testis (lanes 2 and 5) and rat placenta (lanes 3 and 6): 1-3. Anti-TMC6 (EVER1) antibody, (1:800). 4-6. Anti-TMC6 (EVER1) antibody, preincubated with the control peptide antigen.